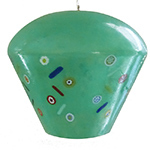 Murano glass hanging lamp in the popular wildflower pattern. This tube light is approximately 8 1/2 inches tall and 4 inches in diameter. 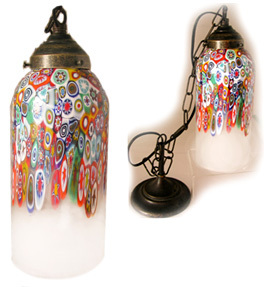 Using the famous millefiori (thousand flowers) canes, a random pattern of brightly colored slices are picked up by the glassblower as he continues blowing, the slices are exaggerated as blows the bubble, then pulling it into a tube, he completes the lamp. The clear glass on the bottom has been sandblasted (satinate in Italian) so that no harsh light comes through. Recommended 60 watt bulb. Sturdy chain mounting as shown are also included. Designed by Arianna and blown in her father's furnace on Murano.